Although HMD Global recently unveiled a brand new mid-range smartphone, the Nokia 7.1, it appears that the Finnish company has at least one more surprise in store for its fans. HMD has two other announcements to make this month on October 11 and October 17. The first event will take place in India, while the second will be held in China. Rumor has it, a Nokia 7.1 Plus will be introduced in India later this week, but we now have confirmation that the phone that HMD will launch in China is the Nokia X7. 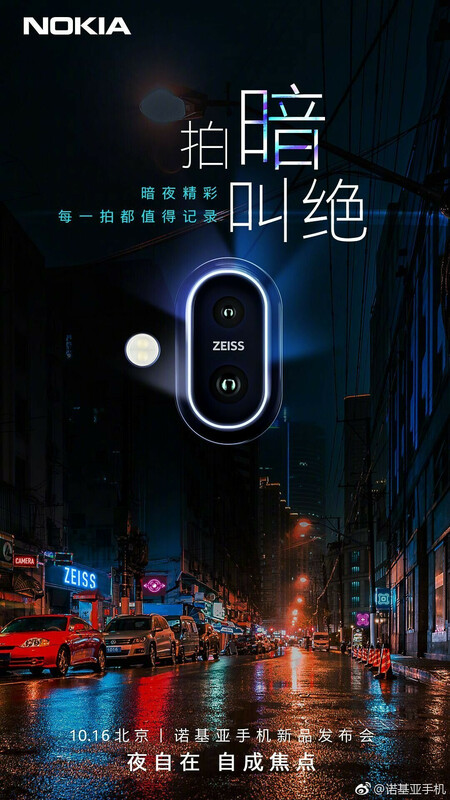 An invitation that points to a Nokia X7 reveal has just popped up on Weibo and, to our surprise, it contains info about some of the phone's specs. For starters, Nokia X7 will definitely pack a Zeiss-branded dual rear camera. The dual-tone LED flash is also visible in the invitation, along with the announcement date: October 16. The rest of the phone's specs include a mid-range Qualcomm Snapdragon 710 processor, either 4GB RAM and 64GB storage or 6GB RAM and 128GB storage, as well as a 6.2-inch fullHD+ display. Nokia X7 should be powered by a 3,400 mAh battery and it's likely to run Android 8.1 Oreo right out of the box. We don't have any details regarding the price, but we expect the Nokia X7 to cost less than the Nokia 7.1, which is now available for pre-order for $350. Interesting. If priced lower than the already affordable Nokia 7.1, then I suspect it may only be launched internationally. Looks to me like this will be specific to certain regions only. However, if it does launch in the U.S. as well, it’s not like that would be a bad thing, lol. Eager to know more about the X7. Why would the X7 cost less than the 7.1 unless the 7.1 has the better specs? Would be easier if they didn't go so crazy with the too similar names. I doubt that the 7.1 Plus will be less than 7.1 due to the Plus model having slightly superior specs, like the SoC. The naming strategy is fine, and follows a similar naming strategy as Apple and Samsung.